Delta Air Lines seeks a Tokyo Haneda base. Skymark a potential partner, to shake up alliances? When JAL was going through bankruptcy in 2010/11, Delta Air Lines pulled all the levers to establish a JAL/Delta alliance. But JAL was persuaded to remain with its oneworld partners. With ANA staying firmly in the Star Alliance camp and only two major network airlines in Japan, this left Delta as the extra leg. Each of the other alliances has anti-trust immunised trans-Pacific partnerships, a substantial market advantage. Skymark Airlines had meanwhile quietly been establishing as a profitable low cost domestic operator. Next year it receives the first of its six A380s and plans to fly - in all-premium configuration - to New York. So when Delta seeks greater access to Tokyo Haneda Airport, where Skymark is conveniently based, the prospects for a partnership become real. Delta CEO Richard Anderson is calling on the Japanese Government to let Delta move its main Japanese base from Narita to Haneda, but Delta would probably be satisfied just to receive additional Haneda slots. The proposal comes as the Japanese yen weakens, hurting Delta's outbound Japanese market. A Haneda base would make Delta flights more attractive and greatly enhance operational cooperation with Skymark. The feelings will have to be reciprocal and so far Skymark has chosen independence, but the weakening yen has partially caused Skymark to post a USD25.1 million loss in 1Q2013 compared to a USD600,000 profit a year earlier. As Skymark prepares to launch its ambitious trans-Pacific A380 services, a Delta partnership could offer much needed US feed for its New York route, where the Skymark brand is unknown. Mr Anderson in Tokyo on 31-Jul-2013 called for the Japanese Government to permit Delta to move its Japanese base from Tokyo Narita airport to downtown and more convenient Tokyo Haneda, by allocating the carrier a hefty 25 daily slots. Mr Anderson's request comes as the Japanese Government prepares to allocate 42 additional Haneda slots in 2014 for daytime international services. Haneda has primarily been a domestic airport with the exception of recent international flights, although these are mainly at night and the early morning. Airlines have found these Haneda slots to be unpopular as there are limited ground transportation options at those hours except for expensive taxis. The slots almost entirely prohibit connecting traffic. Airlines have thus reduced or cancelled existing services while others have dropped proposals to serve Haneda instead of Narita. 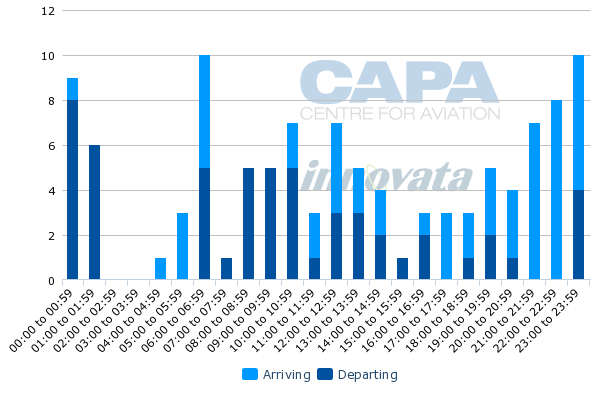 The graph below shows the concentration of international movements at Haneda being in the evening and early morning. The mid-day international services are limited regional flights to and from cities like Beijing, Hong Kong, Shanghai and Seoul. Mr Anderson hit out at the Japanese Government, saying: "I think their measured approach is that they'd like to leave us at the less preferable airport outside of town to advantage the two incumbent flag carriers," as reported by local media. He made his request sound as if it was time for a favour to be returned, noting that Delta (then Northwest) had moved from Haneda to Narita in 1976 at the government's request. Mr Anderson's call may have been considered crafty lobbying if it were in the US, but in Japan it risks coming off as too blunt and even offensive - the more so, as it is probably not far from the mark. But the effectiveness of the angry bull negotiating strategy is well documented in Japan and, right or wrong, is hardly a smart one to adopt. 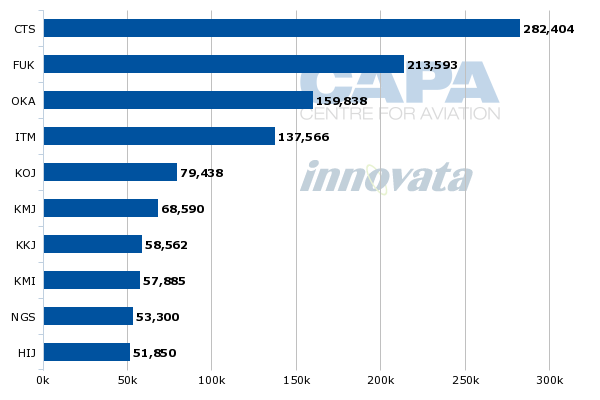 All Nippon Airways and Japan Airlines have the most international capacity from Haneda while Delta has the largest among the US carriers. The advantages of a greater presence at Haneda are multi-faceted. Greater capacity makes Delta more attractive as the journey time from central Tokyo to Haneda can be under half an hour compared to 90-120 minutes for Narita, and Haneda is less expensive to reach. Delta's Japanese business is under pressure following, by its account, a 25% depreciation of the yen. Carrier president Ed Bastian remarked that yen pressure negatively affected quarterly profits by USD60 million even as the carrier has some currency hedging in place. Delta has already worked to reduce capacity into Japan and Mr Bastian said that as the carrier looks towards the end of 2013 and 2014 it would take additional steps to rationalise its Japanese capacity “in light of the new economics and weaker yen”. United also attributed its weaker performance in its Pacific markets – a 3.4% decline in unit revenues and a 4.2% fall in yields – to yen weakness and capacity increases in those markets by its competitors. Carrier chief revenue officer Jim Compton remarked that the yen’s depreciation reduced United’s top-line revenue in 2Q2013 by USD30 million and remarked that “we expect the year-over-year pressure to continue throughout the remainder of 2013”. With pressure on the business, Delta needs to make its offering as attractive as possible. Haneda slots would help significantly. American, which has little Haneda capacity, and United with no Haneda capacity would face the awkward position of having their services at more distant Narita. Moving them to Haneda would reduce their ability to have international connections, which ANA and JAL mainly offer from Narita. Greater access at Haneda and, critically, more convenient daytime slots, would create new opportunities for Delta. Mr Anderson said he would like to partner with a Japanese carrier. With ANA and JAL firmly tied to United and American Airlines, and Delta having already unsuccessfully wooed JAL, Japan's two main carriers are unlikely brides. The obvious target is Skymark, Japan's third-largest carrier by some distance. Skymark is conveniently based at Haneda, which would facilitate domestic feed. Skymark's presence at Narita is minimal. Skymark serves a mere seven Japanese cities from Haneda while JAL serves 32 and ANA 40, but Skymark serves five of Haneda's six largest domestic markets: Sapporo, Fukuoka, Okinawa, Kagoshima and Kumamoto (excluded is Osaka Itami). Capacity is heavily concentrated on top routes. Skymark is a fraction of the size of ANA or JAL but its network is decent enough to facilitate transfer traffic for Delta and also to have its own loyal base. When Skymark receives additional Haneda slots, it could more confidently enter unserved markets if it knew it had some transfer traffic to complement local demand. So long as American Airlines has an ATI JV with JAL, and United with ANA, Delta is left as the only major US mainland carrier without a Japanese partner. 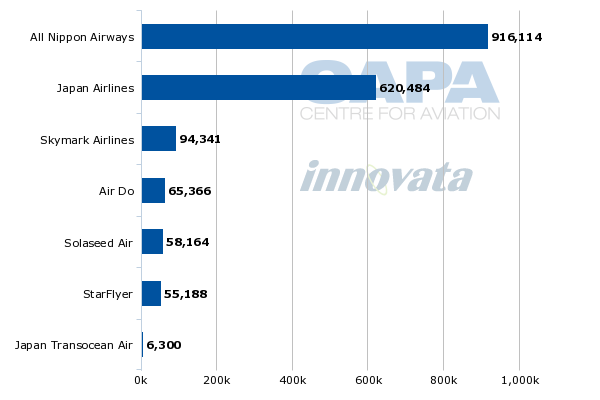 Delta does, however, already have a very limited frequent flyer relationship with Skymark for its Japanese members, as well as some fifth freedom flights of its own from Narita that act as feed, whereas AA and United mainly rely on their partners. A Delta-Skymark partnership does more than threaten AA/JAL and United/ANA. 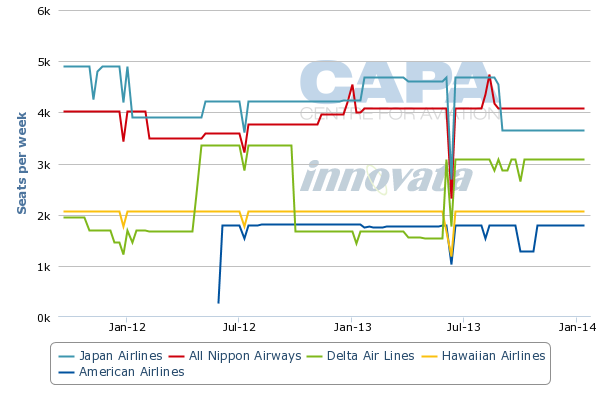 Skymark is Japan's most efficient airline, as CAPA's recent Asian airline cost ranking found. Skymark has a CASK nearly USD7 cents cheaper than ANA despite a similar stage length. This shifts the economics on a connecting tag. Where AA/JAL and United/ANA have an advantage over a potential Delta-Skymark partnership is international sixth freedom traffic flows. ANA and JAL have wide regional Asian networks while Skymark's scheduled capacity is all within the domestic Japanese market. But these sixth freedom traffic flows are low yielding and will be increasingly competitive as neighbours ramp up their own North American capacity. Asiana, EVA Air and Korean Air all plan significant expansions to North America. Chinese carriers meanwhile are significantly growing in North America and themselves beginning to target sixth freedom traffic from around Asia - and are further advantaged by American and United being prevented from codesharing on their Japanese partners' services due to Chinese limitations on third-country codesharing. A Delta-Skymark partnership would allow Delta to concentrate on the core Japanese market and have in Skymark an efficient partner. There are possibilities Skymark could enter regional international flights in the long term. For the rest of Asia, Delta is eyeing more non-stop services from the US. Delta has made recent additions to its Chinese network and is eyeing non-stop US-Hong Kong/Taipei service. So it is not essential for Delta's Japanese partner to have regional Asian flights, especially when Delta already covers key markets. United also has a wide network of non-stop Asian services while American does not, and thus has the most to lose. From Emirates-Qantas to Singapore Airlines-SAS and even conservative Cathay Pacific getting in the mix with a deal with Air New Zealand, strategic alliances are critical to open markets and gain synergies. Deep alliances, such as anti-trust immunity, have been forged in both markets Skymark is targeting for A380 services: Europe and North America. Across the Pacific, JAL is with American Airlines while ANA is with United Airlines. Korean Air and Delta have mulled deeper cooperation of their own. These partnerships expand flight options, both by city and time, and lead to higher bookings. ANA reports that following its ATI JV with United, United booked approximately 300% more codeshare seats (off an undisclosed base level) on ANA. JAL, in launching its Tokyo Narita-Boston service, made a point of saying how partner AA's presence there helps the flight, likewise for ANA to Seattle. JAL and AA account for approximately 25% of available capacity in the Japan-US market while ANA and United account for 30%. Delta alone accounts for about 25% while other carriers, including Hawaiian Airlines and fifth freedom carriers comprise the rest. Skymark, with no partners, faces the unenviable position of a single initial service to North America, possibly ramping up to two or three depending on its balance to Europe (it has mulled Frankfurt and London as destinations). 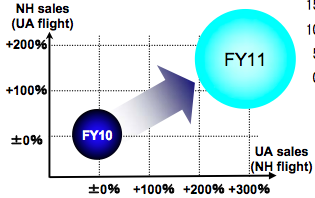 While Skymark is keeping its FY2013 guidance unchanged, this was a significantly negative start. It did occur as the operating environment across Japan weakened as fuel bills went up due to the yen's weakening, but this represents a negative 13% margin. It is a poor base to be embarking on risky trans-Pacific services, let alone on an all-premium A380. The necessity for a trans-Pacific partnership grows. Just as Delta did in 2009 when it targeted JAL as a partner, Delta is laying out a bold vision for its future in Japan, and indeed Asia. And this time, as previously, Delta partner Korean Air would be offered the role of second fiddle. Delta's priority is to build a stronger position in Japan and ideally have a partner. It would be difficult to have a complementary partnership 90 minutes away in Seoul Incheon, the hub of Korean Air. This is especially true when Korean Air is a large Asia-North America competitor in its own right. It took some time for the Delta-Korean Air relationship to be mended after Delta so aggressively sought JAL. Korean Air last year even proposed a deeper partnership with Delta. But Korean Air may not be as forgiving if it happens again. It wants to shake the status quo but still has flavours of a legacy environment. Skymark’s management is described as having demonstrated innovation in other sectors, like IT, and finding the status quo of aviation in Japan (namely high cost and low service considering the price) unacceptable. Management wants to bring change and are arguably the best equipped in Japan to do so, owning a lean structure but also the right management mentality. Corporate culture dictates meetings should be brief and to the point to allow for maximum productivity. Yet somehow Skymark still feels shackled to Japan’s old world of aviation. Its IT is considered too limiting, even by aviation standards. Full codeshares, interlines and frequent flyer agreements are not possible, and these are the basic blocks of a partnership. An IT upgrade to address these matters and facilitate partnerships would be a multi-year effort. While Delta was historically focused on the US market, it has become an effective international participant, not just through organic growth and its merger with Northwest, but acquisitions of Virgin Atlantic and Brazil's Gol. Delta is known in some circles to have smartly let regional international managers drive strategy rather than have staff in far away headquarters try to be local experts. Following an ATI agreement with Air France-KLM, the stakes in Gol and Virgin Atlantic, Asia was the white spot on Delta's map for a strategic change. Delta may be asking too much, and not nicely enough in public, of the Japanese Government, but it cannot be faulted for having a vision that could be realised even if it receives some of its 25 requested Haneda slots. A partnership with Skymark, which would require significant coaxing, could be a significant victory. Delta may have had its tail between its legs after losing JAL's prospective partnership, but there are some interesting dynamics to be played out over the coming decade. Japan, until now the goldmine of Asia, with its high premium base and high GDP per capita, is steadily being overhauled by its neighbours. As other North Asian and Chinese airlines grow and Japanese airlines fail to adjust their top heavy cost bases, a position for Delta where it has a partnership in each major part of Asia – Skymark in Japan; China Eastern, China Southern and Xiamen Airlines in China – may be more lucrative than being confined to JAL. Delta lost round one in Japan, but the battle is just beginning.